Image caption The children's mother said it "was intended as a joke"
Two firefighters who bound a pair of visiting children up in cling film have been given written warnings. 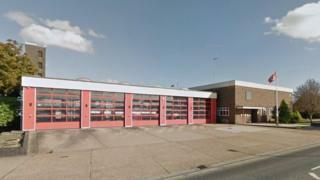 The incident, which involved the children of a crew member, was caught on camera at a fire station in Southend. Essex Fire Service investigated after the BBC notified it of photographs sent by a concerned party. The service said a "thorough investigation took place and appropriate action has been taken". The photographs were passed to the BBC by a third party who was concerned because of the role cling film - and other means of binding - had allegedly played historically in fire service initiation rites. However, the mother of the children in the photographs said what happened "was intended as a joke" and the youngsters enjoyed it. Initially, the fire service restricted the watch involved in the incident to just core duties, meaning it was barred from carrying out community work. Those restrictions have since been lifted. Image caption Roger Hirst, the fire and crime commissioner for Essex, said he was "clear that the behaviour" was "inappropriate"
A fire spokesman said: "We can confirm that no harm was caused to the children, and that the parents were present throughout the event. "The pictures were selective and didn't reflect the full situation, although those involved are regretful for any damaging media publicity this has caused to the fire service. "Essex County Fire and Rescue Services now considers the matter closed." It is understood the two officers involved have been given first written warnings. Roger Hirst, the police, fire and crime commissioner for Essex, said he was "clear that the behaviour shown in these photos is inappropriate".